This page covers telecom/wireless questionnaire set prepared by experienced specialists in telecommunication domain. This domain has always demand right from design,testing and installation. These top 10 telecom interview questions and answers help engineers seeking telecom job to crack the interview.These questions are very useful as viva questions also. Question-1:	Explain basic block diagram of wireless system. Explain the function of scrambler or randomizer. Answer-1: As we know wireless system consists of two main parts viz. transmitter and receiver. scrambler removes long stream of 1's and 0's. This will help distribute energy over larger bandwidth rather than it concentrated around narrow BW. Refer Wireless System Overview➤ and Scrambler and descrambler➤. Question-2:	Explain the function of forward error correction module in a digital communication system. Answer-2: The module FEC helps in correcting the errors at the receiver using the redundant bytes transmitted along with the original information bytes. This module helps in eliminating re-transmission of information bytes. In FEC, transmit end will have convolution encoder and receiver end will have viterbi decoder. Refer Forward Error Correction Basics➤. Question-3. What is Bit Error Rate and how it is calculated? Answer-3: Bit error rate (BER) is used to measure performance of the wireless or wired system in channel or impairment environment. BER is the ratio of received erroneous bits to the total number of bits transmitted. Question-4. What is the difference between analog and digital modulation? 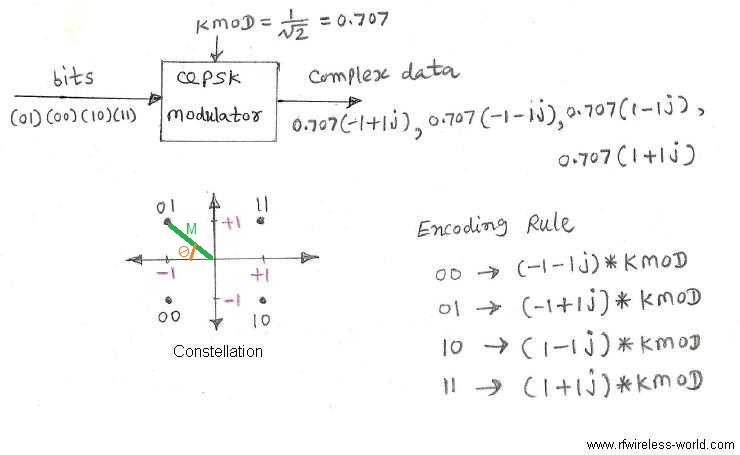 Explain QPSK modulation scheme. Answer-4: Analog modulation will have baseband information in analog form and digital modulation will have baseband information in digital form. QPSK stands for Quadrature Phase Shift Keying. It is the modulation technique which transmits 2 bits per carrier. It is the most robust digital modulation technique after BPSK modulation. Question-5. What is delay spread? How it can be tackled in communication chain? Answer-5: Delay spread is the time delay signal incurs while travelling from transmitter to the receiver. Delay spread results into ISI (Inter Symbol Interference). The concept of cyclic prefix is used to tackle ISI and delay spread. Refer Delay spread Vs Doppler spread➤ and What is Cyclic Prefix➤. Answer-6: The variation is received signal strength over time is referred as fading. When the signal traverse from transmit end to receive end, it will have many reflections from buildings and walls till it reaches receive end. This results into multipath fading. Question-7. What is diversity? Explain types of diversity techniques. Answer-7: The diversity utilizes effect of fading to recover the information from the corrupt received packet. Various types of diversity are space diversity, time diversity, frequency diversity, polarization diversity, directional diversity, pattern diversity, transmit-receive diversity etc. Refer Antenna diversity basics and types➤. Question-8. Explain RF link budget with equation. Question-9. What is the difference between coherence bandwidth and coherence time? Answer-9: Frequency range and time period over which channel remains constant is referred as coherence bandwidth and coherence time respectively. Refer Coherence BW vs Coherence Time➤. Question-10. What is the relation between wavelength and frequency? Answer-10: Wavelength and frequency are inversely proportional to each other. Question-11. What is the difference between Erlang and GoS? Answer-11: Both Erlang and GoS are used in telephone exchange for measurement of calls such as calls dropped, calls passed etc. Question-12. What is the difference between CAS and CCS? Answer-12: CAS stands for Channel Associated Signaling and CCS stands for Common Channel Signaling. Both are associated with PCM used in telephony. Question-13: Often it is asked to differentiate between single carrier and multiple carrier systems(i.e. OFDM, OFDMA)? Answer-13: SC (single carrier) system carry less information while multi carrier occupy multiple bits simultaneously. Hence data rate is higher for multicarrier compare to single carrier system. In addition to the above telecom interview questions and answers, one need to throughly prepare the project carried out during academic curriculum. Also prepare questions on the technologies related to the products of the company where interview need to be given. Refer Wireless FAQs-Frequently Asked Questions Set.